Click the button below to add the Mimaki JV5 Y-Axis Motor with Pulley - M009195 to your wish list. This carriage Y motor axis with pulley is suitable for Mimaki JV5 printers. This is the original Mimaki part (number M009195). 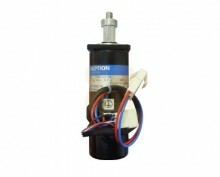 This complete motor includes the pulley. The motor without pulley is also available (part number E300475) but we recommend purchasing the complete motor as it is easier to install.